Recently elderly people has become majority and hiatal hernia also has become one of common diseases in many countries. Surgical treatment for the disease is sometimes needed. Primary repair of large hiatal hernia is associated with a high recurrence rate. Reportedly, the use of mesh reduces this recurrence rate. The indication for mesh use, the type of mesh to use, and the placement technique are controversial. 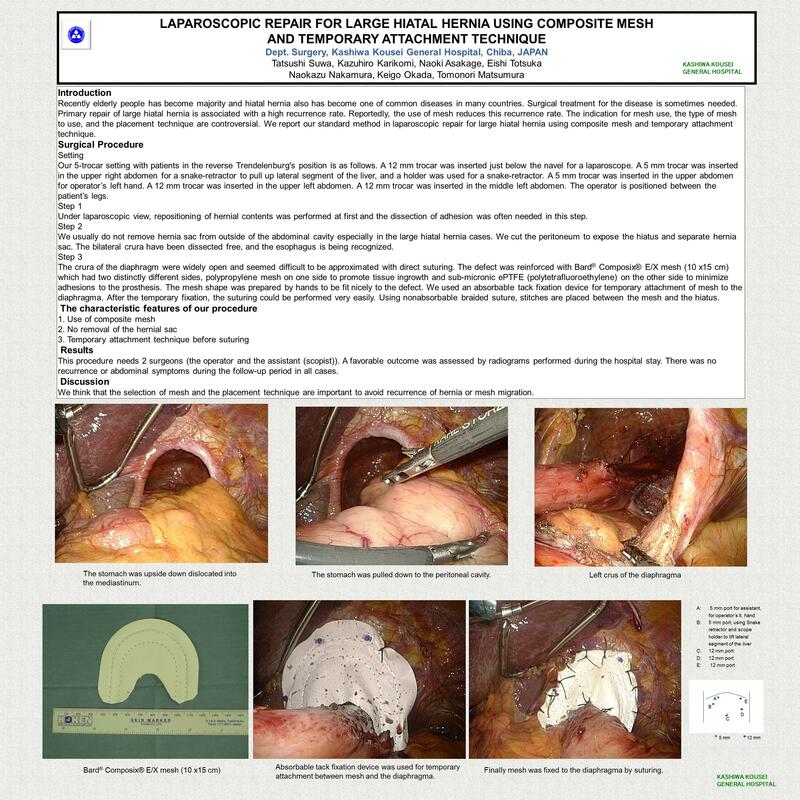 We report our standard method in laparoscopic repair for large hiatal hernia using composite mesh and temporary attachment technique. Our 5-trocar setting with patients in the reverse Trendelenburg’s position is as follows. A 12 mm trocar was inserted just below the navel for a laparoscope. A 5 mm trocar was inserted in the upper right abdomen for a snake-retractor to pull up lateral segment of the liver, and a holder was used for a snake-retractor. A 5 mm trocar was inserted in the upper abdomen for operator’s left hand. A 12 mm trocar was inserted in the upper left abdomen. A 12 mm trocar was inserted in the middle left abdomen. The operator is positioned between the patient’s legs. Under laparoscopic view, repositioning of hernial contents was performed at first and the dissection of adhesion was often needed in this step. We usually do not remove hernia sac from outside of the abdominal cavity especially in the large hiatal hernia cases. We cut the peritoneum to expose the hiatus and separate hernia sac. The bilateral crura have been dissected free, and the esophagus is being recognized. The crura of the diaphragm were widely open and seemed difficult to be approximated with direct suturing. The defect was reinforced with Bard® Composix® E/X mesh (10 x15 cm) which had two distinctly different sides, polypropylene mesh on one side to promote tissue ingrowth and sub-micronic ePTFE (polytetrafluoroethylene) on the other side to minimize adhesions to the prosthesis. The mesh shape was prepared by hands to be fit nicely to the defect. We used an absorbable tack fixation device for temporary attachment of mesh to the diaphragma. After the temporary fixation, the suturing could be performed very easily. Using nonabsorbable braided suture, stitches are placed between the mesh and the hiatus. This procedure needs 2 surgeons (the operator and the assistant (scopist)). A favorable outcome was assessed by radiograms performed during the hospital stay. There was no recurrence or abdominal symptoms during the follow-up period in all cases. We think that the selection of mesh and the placement technique are important to avoid recurrence of hernia or mesh migration.